During the winter months, I’m all about comfort food. 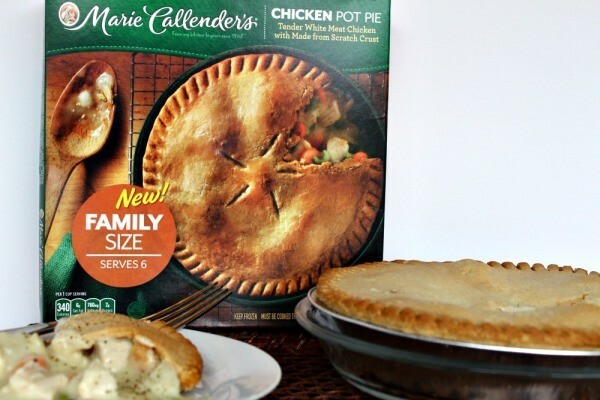 Whether it’s soup, a warm pasta dish or something that goes from freezer to oven to the dinner table like Marie Callendar’s Pot Pies, I like something warm to eat. I’m also all about dessert. I’ll admit to you right here and right now that my family eats some sort of dessert after our meal several times a week. It might be a bowl of ice cream or something slightly more spectacular such as a Chocolate Lava Cake. 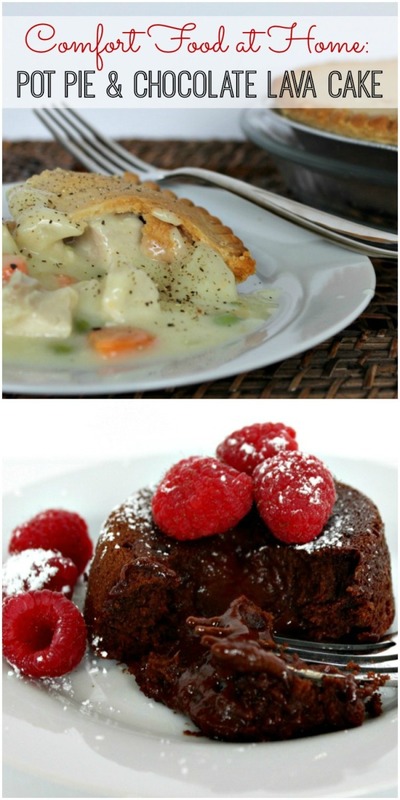 There’s no better way to follow a warm chicken pot pie, than with a chocolaty warm dessert. 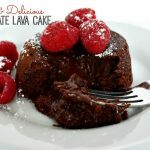 If the idea of making a Chocolate Lava Cake intimidates you, let me tell you there’s no need to let it. It is easier than you think! Your family will be surprised and quite impressed when you pull these out of the oven. Keep reading for the recipe! I’ve been purchasing Marie Callendar’s Pot Pies for years. Before our kids were born, a meal of two single serve chicken pot pies was quite common. I was very excited when I saw the family size at my local Walmart. They feed 6 and between the homemade gravy mixed with vegetables, all white-meat chicken, in a made from scratch golden flaky crust, plus the ease of dinner prep; it just doesn’t get much better than that! Yuuuum. Are you hungry yet?! While the pot pie was cooking in the oven, it freed me up to do a couple of household chores and whip up the Chocolate Lava Cake. As soon as I took the pot pie out of the oven, I put the cakes in. I love easy meal prep like this and since these lava cakes are best served right out of the oven, it was important that the main meal was easy to prepare. For those of you thinking ahead to Valentine’s Day, this is the perfect at home dinner idea for you and your Valentine. You won’t be exhausted from meal prep, you can be confident that you’re serving something that delivers the true sense of homemade and you’re ending it with a cake he or she will be talking about for a long time. 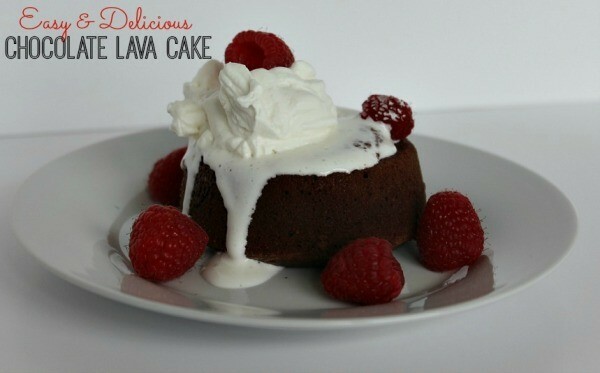 I wanted to kick this lava cake up a notch, so I added a little something extra – orange extract. Wow, oh wow was the taste of chocolate, orange, raspberry and whipped cream something so amazing and comforting, you just have to experience for yourself. These were made in ramekins, which can be found most places, such as Walmart. Pick up your pot pie and your ramekins in one easy location. A chocolaty, warm dessert that's easy to make and will receive rave reviews. 2. Melt the chocolate chips and butter together in a microwave safe bowl in the microwave. Start with 30 seconds and stir. Add an additional 30 seconds if mixture is still not melted. 3. After the mixture is melted, add the sugar, vanilla and orange extract and whisk together. 4. Allow the chocolate to cool just a bit (about 3 to 4 minutes) before you add the eggs. After it's cooled slightly, add the eggs one at a time, whisking after each one. Whisk until batter is smooth. 5. Stir in the flour until mixed in. 6. Spray generously the bottom and sides of 2 ramekins with cooking spray. This is necessary so they will release easily and in tact. 7. Add the batter to each ramekin. They will both be about 3/4 full. 9. You can serve the cake in the ramekin or turn it onto a plate after one minute. To do this, put the plate over the ramekin and turn them both upside down. Slowly lift the ramekin. If the cake seems to not be releasing, turn it back over and take a butter or pairing knife and run it along the edge to release. Flip the ramekin onto the plate again and release. 10. This is where you can get creative. 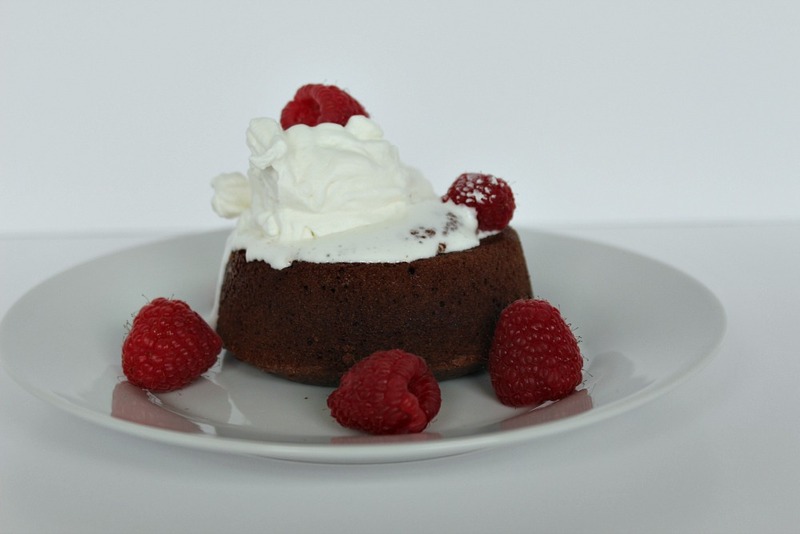 Serve the chocolate lava cake with raspberries and whipped cream as I did. You could also serve with ice cream or orange slices. It's also delicious dusted with powdered sugar. 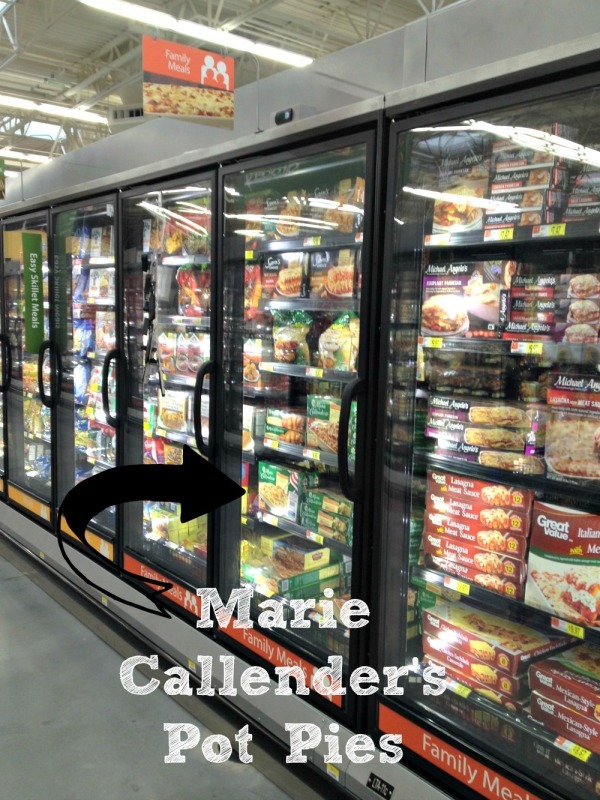 Visit http://www.mariecallendersmeals.com/ for information on all of the Marie Callendar’s pies and then visit http://potpieplease.com for more great recipes. It’s also fun to visit the Marie Callendar’s Facebook page for recipes and mouth watering pictures. As a former military family, I’m excited to share with you their Comforts from Home project. You can read about how they’re supporting our troops here. Hi! I have a 7 oz ramekin do you think that will be a good size? I don’t think I saw the ramekin size listed anywhere unless I was reading too quickly 😀 Sine usually all recipes I find say 4 oz I was hoping I can use my 7 oz ramekin to make these, if so do I need to bake on the longer side (12 min)? 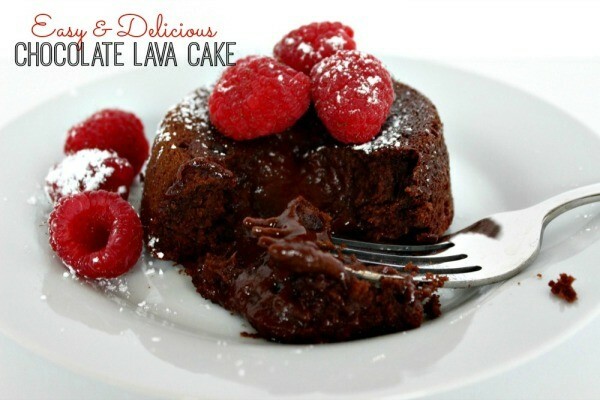 I really love this recipe because its so simple and easy, no powdered sugar, etc! Also, I plan on only making one for myself so can I use 1 egg, 1 tbsp. butter, 1 flour, etc?? Thanks I cant wait to try these soon!